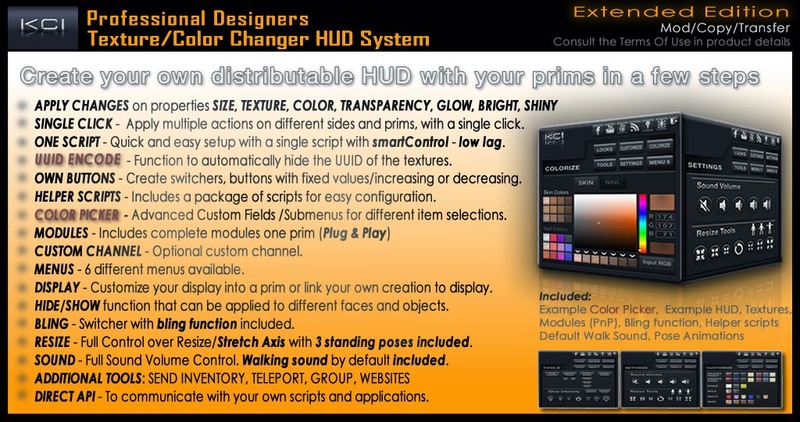 Create your own HUD with Professional Color Picker and Texture Changer HUD. Is an Custom Changing System designed for creators and personal use. 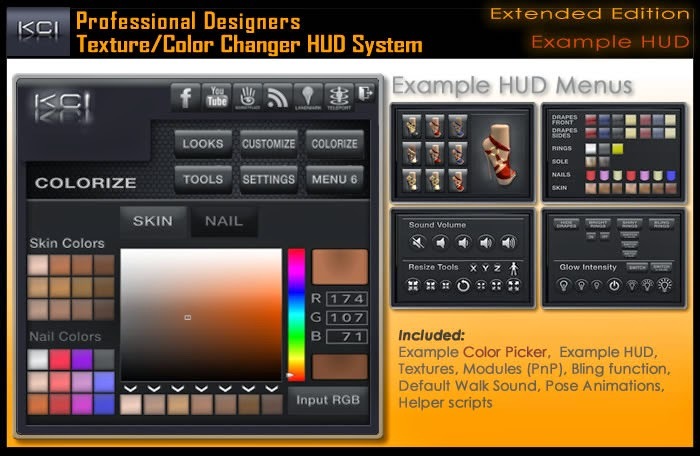 Included multipurpose tools to resize, recolor, retexture, transparency, glow, bright, shininess..
· The Texture & Color Change HUD is equipped with multiple tools to modification of the visual properties of its creacions for multiple objects and faces. · Include UUID ENCODE function to automatically hide the UUID of the textures and does not allow to get them. · The Changing System is a FULLY CUSTOMIZABLE universal HUD system for multi purpose, with an easy and quick setup, with UNLIMITED BUTTONS and combinations, with or without the use of notecard. The buttons can be set to: fixed value, increase or decrease the value, or act as a switch with default or fixed values. · The Change System uses ONLY ONE SCRIPT in your HUD and a script in your target object. Scripts are provided with Smart Control Script - self-control system to reduce the lag to a minimum. · The System features with a Advanced Color Picker to recolor the selected items from the submenu. Very useful to select custom color for different parts and faces (nails and skin color, clothing items, buildings, environments .. etc). - COLOR PICKER - Advanced Custom Fields Color Picker with Submenus for different item selections. - ENCODE UUID - function to automatically hide the UUID of the textures. - SINGLE ACTION - Apply several modifications on different prims with a click. - MULTIPLE ACTION - Apply multiple actions on different sides of one or more prims, with a single click. - HELPER SCRIPTS to easy configuration. - SINGLE CLICK - Apply changes in textures, color and transparency with a single click. - MODULES - Includes complete modules one prim (PLUG & PLAY). - CUSTOM MENUS - 6 different menus available. - CUSTOM DISPLAY - Customize your display into a prim or link your own model (creation) to display. - CUSTOM BUTTONS - Creating custom buttons: switcher, with fixed values ​​or increase and decrease. - HIDE/SHOW function that can be applied to different faces and objects. - BLING Switcher with default function included. You can also use your own bling script. - Advanced Resizer System with Stretch Axis function. - Configurable resize mesh prim module. - Create and configure custom resize buttons according to the needs. - Default pose animation + three optional standing poses. 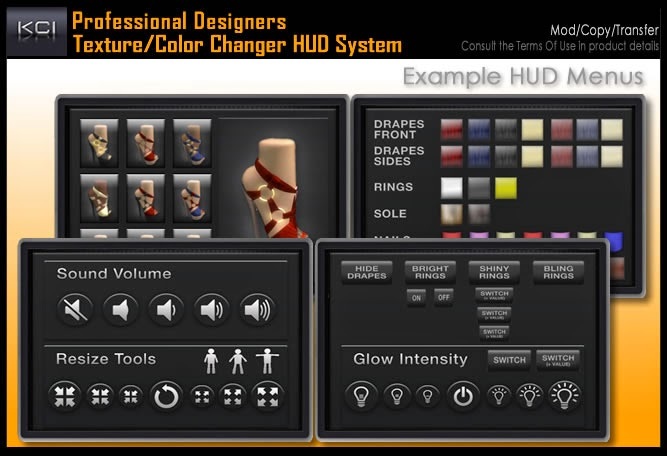 - Create and configure custom Standing Pose buttons according to the needs. - Default Walk Sound included. - Configurable Sound Volume mesh prim module. - Create and configure custom sound volume buttons / switchers according to the needs. - API DEV - to communicate with your own scripts (automatic group inviter, subscription kiosk, bling ...) This function has some variables needed for communication. - Guide Example HUD and Target item.